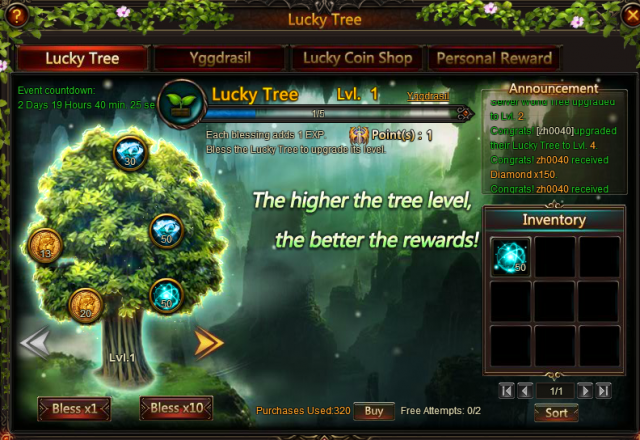 Wanna experience something new in Lucky Tree? Here comes the thing. When players reach 150 Points or above, gift box containing mysterious resources will drop! All you need to do is to click and open them! Good luck! 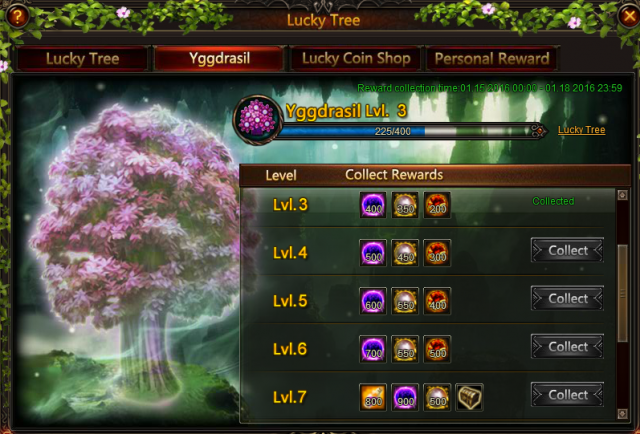 This time, new sylphs Lannister and Ocarina will show up in Lucky Coin Shop! You have a chance to gain Parchment Chest (Rare) and Magic Dust Chest (Rare) again! Besides, new Artifact Purgatory Wand Chests, 5-star Khaos Hero Chest, 5-star Angel Chest, Popstar Fashion, Frost Wings and more new items will be available! 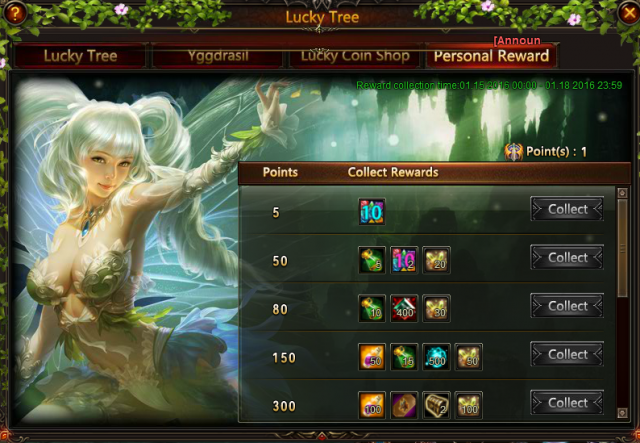 Use your Lucky Coins to buy stunning Artifacts, Angels, Mounts, Gems, Sylphs, and many other resources. 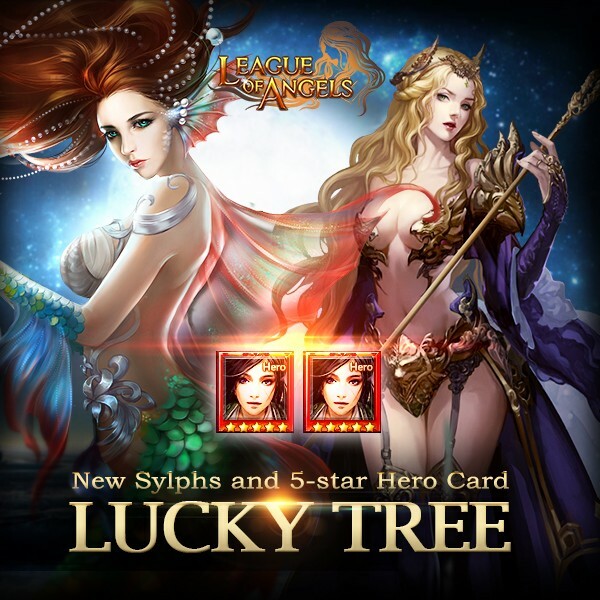 This time New sylph Lannister and Ocarina, Raphael, Demeter,Pandora, Eostre's Awakening Stone,Varda's Icon, Varda Awakening Stone, Amora, Amora Awakening Stone, Bacchus, Seraphim, Ysera, Fortuna, Fortuna Awakening Stone; Amazon Soulhunter, Amazon Hawker, Dark Paladin, Shadow Knight, Nether Lord,Thunder Lord, Dark Valkyrie; Shadow Thorn, The Conqueror, Leroic; Rudolph, Ruthless Leopard, Celestial King, Floe Hunter Soul, Persian Cat, Jade Dragon; Popstar Fashion, Elvish Spring, Wings of Spring, Spirit Foliage, Imperial Weapon Print, Imperial Ring Print, Rowan Chest, Compass Chest, (L2)Imperial Zeu's Sword, (L2) Imperial Pandora's Mail, Khaos Equip. 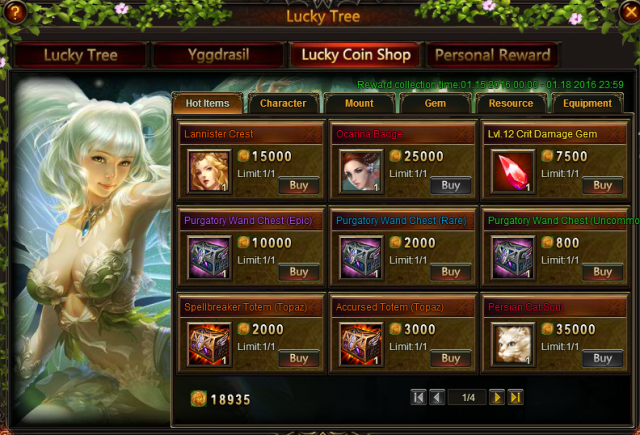 Chest, Khaos Equip Chest, Purgatory Soul, Divine Emblem, Shield of Discord, Heaven's Melody and more are now available in Lucky Coin Shop. inal updates will be determined in game. More exciting events are coming up through Jan. 15 to Jan. 18 (Server time), check them out in the in-game Hot Events menu now!